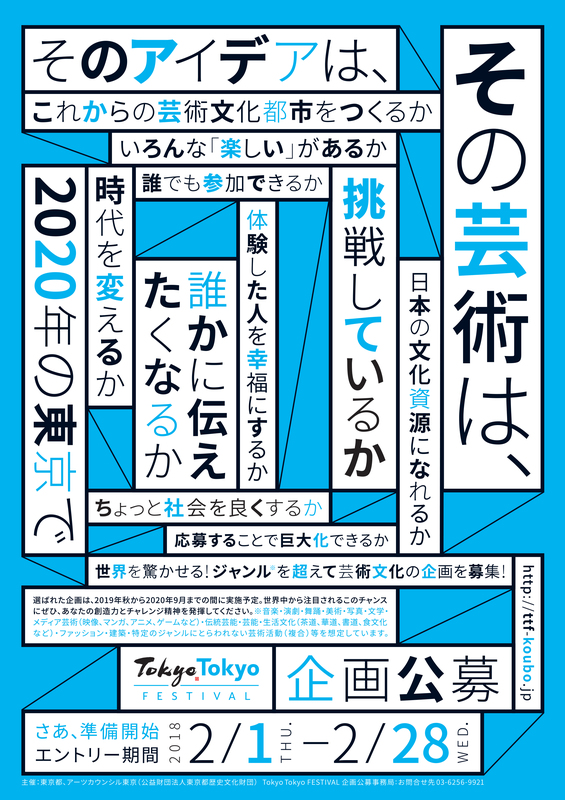 Public Call for innovative and creative plans set in the city of Tokyo! The Tokyo Metropolitan Government (TMG) and the Arts Council Tokyo (Tokyo Metropolitan Foundation for History and Culture) are proceeding a “Tokyo Cultural Program”(*1) in order to create a big wave to achieve a society based on arts and culture towards 2020 and hand it over to future generations. 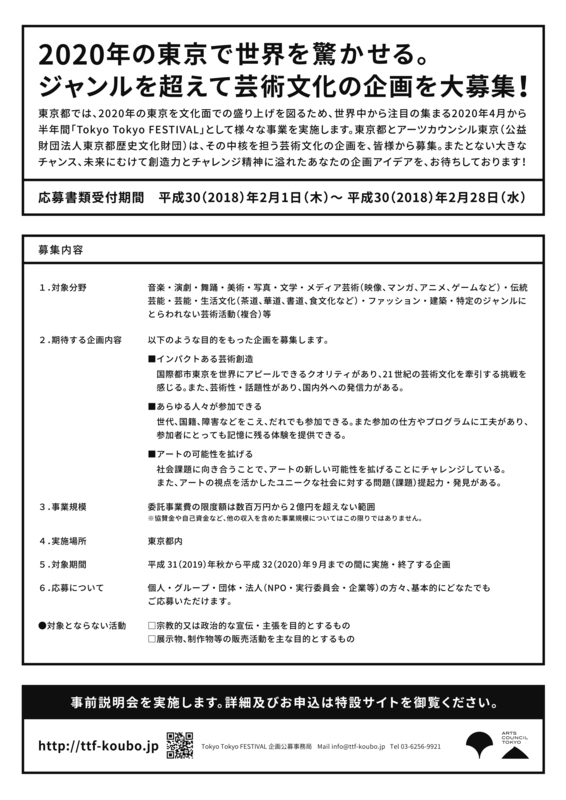 This call, inviting innovative and creative plans and ideas involving more people, aims to play a central role of the “Tokyo Tokyo FESTIVAL”(*2) to be initiated in April 2020. It is expected to make the Tokyo Cultural Program memorable, and enhance Tokyo to be a more creative cultural city in 2020 onward. The selected proposals will be implemented in Tokyo between the autumn 2019 and September 2020 as projects hosted by TMG and Arts Council Tokyo, which will commission productions to the applicants. Anyone can make an application, including individual, group, organization, or company. We look forward to creative and challenging proposals taking this once-in-a-lifetime opportunity. and the Tokyo Metropolitan Symphony Orchestra ahead of 2020.
toward Tokyo at home and abroad. TMG and Arts Council Tokyo (Tokyo Metropolitan Foundation for History and Culture) call following proposal of idea/plan. Selected idea/plan will be implemented as a commissioned project of TMG and Arts Council Tokyo. The range of the cost of a commissioned project itself is supposed to be from millions to 200 million yen. However, the total scale of project, which includes other funds such as support money or own funds, is not limited in this range. *A proposal should mention where to perform a project. An idea/plan is to be implemented between the autumn of 2019 and September 2020. (e.g. NPO, executive committee, and companies). *National governments, local public bodies, and foreign governments are not eligible to make applications. However, they are permitted to be member organizations of an executive committee. foundation or the like. However, it is permitted to be a member organization of an executive committee. 1. December 8, 2017 (Fri) 6:00 – 7:00 p.m.
2. December 13, 2017 (Wed) 2:00 – 3:00 p.m.
3. December 16, 2017 (Sat) 1:00 – 2:00 p.m.
4. December 27, 2017 (Wed) 2:00 – 3:00 p.m.
Arts Council Tokyo develops a variety of programs to encourage the creation and dissemination of arts and culture and to promote Tokyo as an international city of artistic and cultural attractions. In order to improve the infrastructure and environment for new artistic and cultural creation, Arts Council Tokyo plays a key role in Tokyo’s cultural policies by implementing programs that explore Tokyo’s originality and diversity, promoting international cultural exchange, and providing opportunities for promising young people who engage in a variety of artistic and cultural pursuits. Furthermore, Arts Council Tokyo is conducting projects that will serve as the driving force of the Cultural Program in the run-up to 2020.